If you have ever undergone eye surgery, the work was done by a trained ophthalmologist. The specialty of ophthalmology focuses on treating diseases and conditions that affect the physiology and anatomy of the eye. What this means is that an ophthalmologist handles both surgical procedures and medical care for the eye. These doctors are specialists in dealing with multiple eye diseases and conditions. At Carolina Vision Center, we have quality ophthalmologists who will treat you! Becoming an ophthalmologist requires a medical degree and the completion of a residency, just like other branches of medicine. Some ophthalmologists also receive additional training and focus on a specialty within the field. Ophthalmology training covers the entire spectrum of eye care. Ophthalmologists are trained to provide thorough eye exams with the purpose of prescribing glasses or contact lenses, the provision of medical treatment for assorted eye problems, and the performance of complex and delicate eye surgeries for qualified candidates. They also take an active role in conducting scientific research on eye diseases and other serious vision problems. Ophthalmologists work to uncover the causes behind these things and find cures. 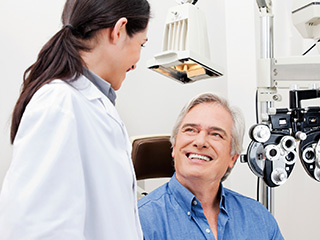 Since ophthalmologists are licensed medical doctors, they are permitted to practice medicine and surgery, unlike optometrists, who focus on performing eye exams, prescribing corrective lenses, and prescribing medications for certain eye diseases. Often, optometrists and ophthalmologists will work in tandem to provide complete eye care for a patient. The field of ophthalmology includes multiple subspecialties in which an ophthalmologist can focus on treating and curing specific types of eye problems. This can make it easier to address the specific needs of their patients. Cornea and External Disease: Diagnosing and treating diseases related to the cornea, sclera, and eyelids are the primary focus of this specialty. Training within this specialty includes doing corneal transplant surgery and other types of corneal surgery. Glaucoma: This specialty concentrates on medical and surgical treatment of glaucoma and other age-related vision disorders that can create optic nerve damage through increased ocular pressure.